Rowan Atkinson's "Johnny English" series has never had much success in the States, and this undercooked new installment isn't going to help. Like the monarchy, the metric system, and the inexplicable desire to refer to Madonna as “Madge,” the “Johnny English” franchise is one of those British things that’s never really made it across the Atlantic. Hatched from an ad campaign that remains considerably funnier than any of the feature comedies that have derived from it, these doddering James Bond spoofs are reliably massive draws on the other side of the pond, but American moviegoers don’t seem to have any interest in seeing Rowan Atkinson wreak havoc as a braindead spy who always manages to save the day (2011’s “Johnny English Reborn,” the second chapter of what’s now a trilogy, grossed a measly five percent of its $160 million take from the United States). If nothing else, the limp and lifeless “Johnny English Strikes Again” serves as final confirmation that America was right to reject these moldy imports — consider it a pyrrhic victory for our paranoid new border policies. 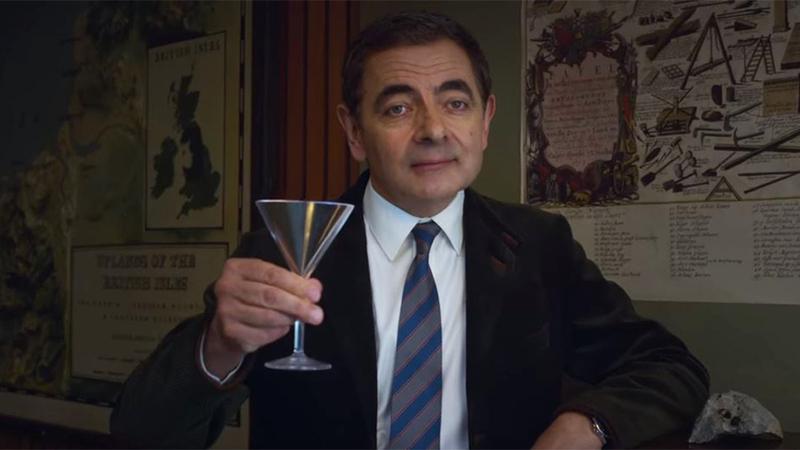 More of the same, but also just a little bit less, “Johnny English Strikes Again” may not boast much appeal for domestic moviegoers, but at least it’s perfectly accessible for any series newcomers who happen to walk into the wrong theater by mistake. The premise couldn’t be simpler: What if Mr. Bean were cast as James Bond? No time travel, no fembots, no sharks with laser beams on their foreheads — the only real difference between James Bond and Johnny English is that one of them adopts “007” as a codename, and the other as an I.Q. score (Neal Purvis and Robert Wade even developed a draft of the first installment the same year they wrote “The World Is Not Enough”). English is essentially a walking parody of “British Intelligence,” and while that could be a fun idea to skewer in the Brexit era, the scattered political commentary in “Strikes Again” is as undercooked as the jokes. It’s been seven years since his last adventure (which ended with English pulling a Frank Drebin and attacking the Queen), and it seems our hero’s incompetence has finally become too much of a liability for MI7. When the story picks up, the disgraced spy is working as a geography teacher at a posh boarding school in the countryside where all the kids love him. And why shouldn’t they? Instead of forcing his students to memorize a map of the world, English trains them in the art of classic espionage. It’s a curriculum of ziplines and exploding pen caps and the right way to seduce a mark, and — if only for a moment — it seems as though screenwriter William Davies has conceived some kind of Hogwarts for old-school spies. That might have been fun. Alas, it’s back to business as usual when someone hacks the British government and reveals the identities of the nation’s secret agents. Cut to: The panicky, power-hungry Prime Minister. She’s played by Emma Thompson, whose performance stirs Theresa May, Tony Blair, and Margaret Thatcher into a desperate stew, and continues the franchise’s tradition of vastly overachieving with its casts (the previous film starred Gillian Anderson, Daniel Kaluuya, Rosamund Pike, and Richard Schiff!). And Prime Minister Thompson is in desperate need of someone — anyone — who hasn’t been compromised by the vicious cyber attack. Enter Mr. English, an analog spy in a digital world. Just like that, he and his bland sidekick (Ben Miller, returning to the fold after being cut out of the previous sequel) are off on a mission to Antibes. Brace for “Quantum of Solace” casualty Olga Kurylenko as a confused femme fatale, “Carol” reject Jake Lacy as an openly sinister Mark Zuckerberg type, and a lot of uninspired physical comedy about a man out of his time. At one point, Thompson even mentions the Kardashians — it’s hard to say if it’s the best moment in the movie, or the worst, but it’s definitely one or the other. The trouble with focusing on the fish out of water element is twofold: One, we already have Austin Powers. Two, it distracts from English’s original conceit: He’s really dumb. Like, spectacularly dumb. Here, however, that special degree of stupidity is watered down by a series of understandable technological hang-ups and preferences; yes, Johnny English is still a buffoon, but — in many respects — he’s also just a slightly exaggerated version of the average 63-year-old man/ex-spy. So when MI7’s resident millennial takes English to the agency’s parking lot and tells him to “take any hybrid you want,” of course he’s going to opt for the gas-guzzling Aston Martin, instead. And this thirtysomething critic would be lying if he said that he understood the whiz kid villain’s evil plan any better than English does (something about controlling the internet?). The film’s most amusing set piece only serves to underscore its poor grasp of the digital world, as English loses his bearings during a VR training exercise and — goggles strapped to his face — starts blindly punching his way across downtown London. At one point he thinks he’s holding a weapon and beating up a henchman, but he’s actually brandishing a baguette and assaulting an old lady in a wheelchair. It’s silly enough to work on a beat-by-beat basis, but the whole thing is so illogical that it falls apart whenever you get a second to think about it. The only way the film can emphasize English’s stupidity is by insulting our intelligence. Is there some kind of augmented reality component at work? Can he not feel that he is holding two loaves of bread in his hands? These questions would be irrelevant in a more absurdist comedy, but first-time feature director David Kerr succumbs to the series’ usual tone, which is hardly even as heightened as an actual James Bond movie. It’s not as funny as an actual James Bond movie, either. The interrogation scene from “Casino Royale” delivers more laughs in just a few minutes than “Johnny English Strikes Again” does in its entire 88-minute runtime (though it’s always amusing when English forgets his own code name). And while the gentle mediocrity of it all is somewhat charming at first — even with such tired material, Atkinson is still a reliably sweet and well-intentioned screen presence — it doesn’t take long for the film to wear out its welcome. Perhaps a case could be made that something about this series is lost in translation, but it’s all delivered in plain English. Johnny English. Universal will release “Johnny English Strikes Again” in U.S. theaters on October 26.